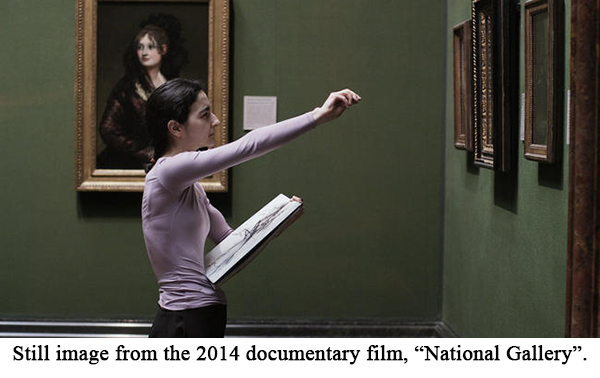 The new documentary by Frederick Wiseman, "National Gallery," allows us to spend three leisurely hours strolling through its galleries, gazing at iconic paintings of Old Masters and listening to museum docents talking about all these treasures. 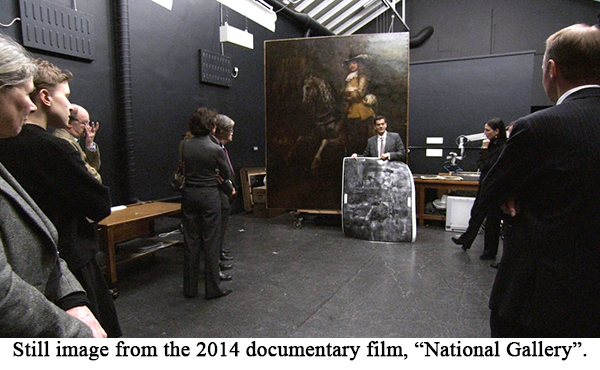 The camera also takes us behind the scenes to observe the slow, meticulous process of restoration of paintings by museum conservators. It's impossible not to admire the huge amount of patience that is so essential to their craft. With the help of the camera, we "spy" on museum curators and various officials debating the issues and logistics of everything that makes great museums run so smoothly. But, here is my small bone to pick with this otherwise luxurious armchair trip through the nooks and crannies of The National Gallery. Some of these people talk and talk and talk... they are very knowledgeable, but, being concise is not necessarily their strength. It's as if Mr. Wiseman felt it would have been disrespectful to edit the slightly verbose communication among all these museum professionals. In spite of being an atheist, I often find myself having a good time in Churches and Temples wherever I go. Just give me impressive architecture and good art, and I am a happy to be there and to observe any ceremony taking place inside. That is definitely the case every time I go to the Cathedral of Our Lady of the Angels, here in LA. Last weekend, I went there with my Fine Art of Art Collecting Class, to meet with well-known Los Angeles artist Simon Toparovsky, whose life-size bronze Crucifix graces the Cathedral's main altar. 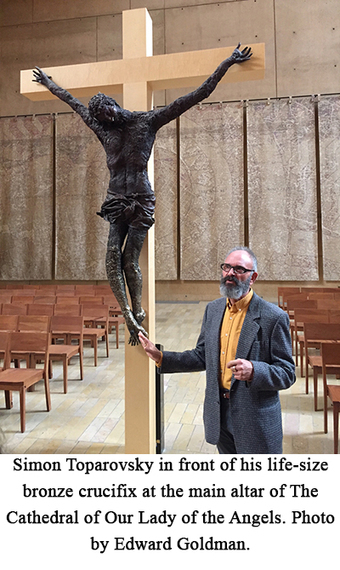 It's been a decade since this sculpture was installed, and the dark red patina on Jesus' feet has completely disappeared, as a result of worshipers kissing and touching its feet. 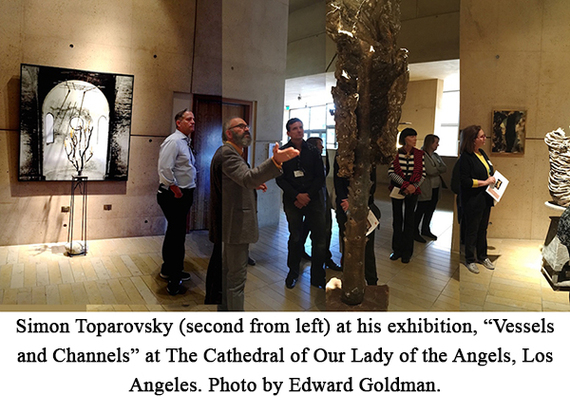 The timing of our visit coincided with the recent opening of Simon Toparovsky's exhibition, "Vessels and Channels," which occupies three Cathedral side chapels. Each chapel serves as a stage for elaborate installations, mixing photography and sculpture, with multiple references to Christianity and the mythology of Ancient Greece and Rome. 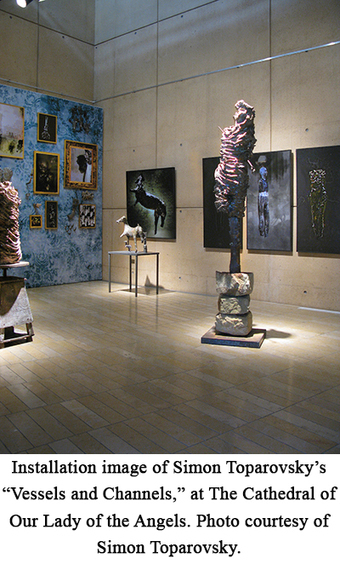 Some of the sculptures on display are rotating, its shadows slowly dancing across the walls. In one installation, we are confronted by what looks like a prison wall covered with vines. A small barred window is at eye level. You peer into the window and discover a beautiful landscape -- a glimpse of freedom composed by the artist's hand and imagination. Smooth, nice, polished treatment of the bronze surface is not what Toparovsky is aiming for in his art. The textures of his sculptures are rough, as if slightly "tortured," and that's what makes his works feel so real, so appealing in their imperfection. During the consecration of the Cathedral in 2002, we Angelenos were pleasantly surprised with the rather daring artistic choices made by the Los Angeles Archdiocese. 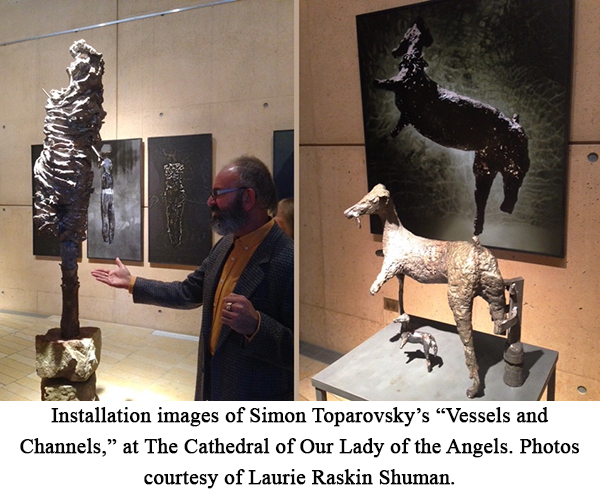 Other artists besides Toparovsky commissioned to create works for the Cathedral were John Nava, Lita Albuquerque, and the late Robert Graham. One wonders if exhibitions of their art at the Cathedral might be in the works. To learn about Edward's Fine Art of Art Collecting Classes, please visit his website. You can also read The New York Times article about his classes here.